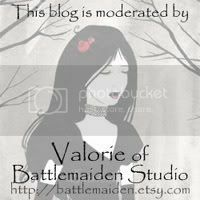 Battlemaiden Studio: Why doesn't Myspace work for me? This is a little bit rant, a little bit suggestion. For those of you who frequent the Etsy forums, you may recognize me as the Myspace cheer-leader. Any time someone asks for a suggestion of where to advertise, that's my first suggestion. I've written tutorials, started huge link exchanges, and done whatever I can to make this great marketing opportunity clear and easy for my fellow artisans. Why do I push Mysapce so much? Well, they're not paying me, I can tell you that much. Myspace has worked wonders for me, for both of my Etsy shops. It's easy to set up, it's easy to keep large numbers of people informed, and best of all, it's free! Now - fast forward to yesterday. I've been building a second business page for my vinyl decal shop, and have been taking the time to send individual messages to all of my new contacts. I have been building the page for less than two weeks now, and it's already resulted in multiple custom orders. However, as I was sending messages to my new friends, I noticed that many didn't have a whole lot going on with thier page. Then, I took a peek at people who had yet to accept or deny my friend request. Each one I clicked on hasn't checked their page in over 2 weeks - many haven't checked it in months! So - What makes Myspace work for me? I tell people it's easy, and it is. But it's still work, and it takes dedication to really make it pan out. So, here are some pointers to get you moving in the right direction. 1) Spend some time setting your page up to best show your work. Try to avoid busy patterns, or loud colors on the background. Lots of flashy graphics may make the page difficult for people to load. Use your Etsy Mini. Write a little bit about yourself, talk about your process, talk about custom orders, give links to other places that they can find you. Give interesting information, but don't give too much. 2) Spend some time adding new friends. I do this in large batches, but if you can't devote 6 hours once every three months to add friends, spend 30 minutes every week or so. The best way to find friends is to look to others who cater to their interests. I friend people who are friends of other fantasy artists, are part of Renaissance groups, or friends of Sci Fi cons that I sell at. This way, a large percentage of people that I'm adding will have an interest in what I do. 3) Check back often. Do not spam people's comments, but it's very accpetable to leave holiday messages, birthday messages, or a very occational "come see what I've got" sort of post. Make your posts something you would click on if you were visiting someone else's page, because this is a great way to hook their friends! 4) Once someone has added you as their friend, send them a message. Don't let them forget you! Talk a little bit about what you do, let them know that you're always happy to do custom work, etc... Invite them to watch your blog so that they'll know when you post something new. 5) When you add something new, blog about it. The best way to make this worth your time is to write the blog, and post it on Myspace, Live Journal, your blog, and any other place it's relevant. Post a bulletin letting people know that you've posted a new blog. This will usually result in a few sales every time! 6) This is most important - check back often, accept new adds, and respond to people's messages. Let people know you're attentive and you care. Really, it is simple, and it does work. But, it IS work, and it takes time. However, once you take the time to set it up correctly, it takes just minutes to to reach hundreds of people who are interested enough in what you do to have added you in the first place every time you've got something new to share. Guess I just need to accept that its not a personal attack on me, just a "no thank you" type of thing.